Brief 1: It seems like the citizens of Japan want the U.S. out of their country. The UK Daily Mail reported that thousands of protesters called for the removal of all of the estimated 47,000 U.S. troops. Apparantly our troops are noisy and pollute as they protect the pacific rim. I say bring em home. Why spend our tax dollars to boost the Japanese economy. There are a lot of communities in the United States that would welcome them and the money they spend. We also need to take all of our equipment and defense technology too. While we are at it, we can take them out of Germany too. Emboldened by the folks who released the data and e-mails creating the Climategate scandal (except for the United States) someone has accessed White House computers and has found President Barack Obama’s Christmas List. Rumor is that Obama is still a Christian even thought he had to be guilted into putting up the White House nativity scene. The list was partially released to The Garlic web site who leaked only one of the items on his list. Based on recent Rasmussen presidential polls, most Americans are thinking he is more naughy than nice so the jury is still out on whether he will get this gift. 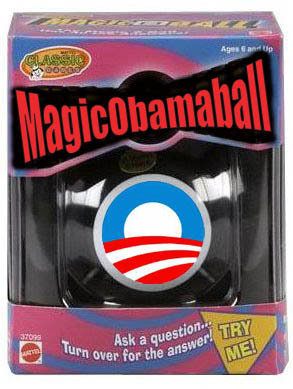 Update: Due to popular demand our staff and designers have been working hard to bring you more Obamagear products. Enjoy! 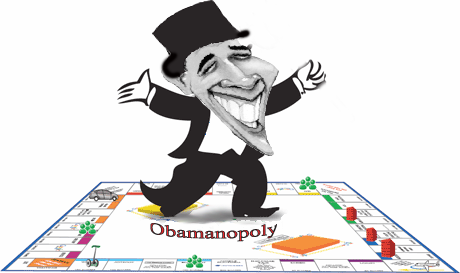 Obamanopoly is the hot new board game in Washington, Los Angles, New York, and apparently Vermont although it has not been selling anywhere else in the country. This is Chicago politics version of the classic Parker Brothers game. The traditional Chance and Community Chest have been replaced with Change and Community Organizer cards. You no longer have a chance to win money when you take your card. The cards only feature different ways to spread the wealth. A funny thing happened when I was recently looking to buy my first Obamagear t-shirt. I was interested in finding a unique shirt, but I just could not find what I was looking for. Should I go for the “believe” shirt or opt for the classic “Yes We Can?” I was actually leaning more toward the “Yes We Did” design. As I was looking at web sites, I was pleased to find that I could buy all of my Obamagear easily at the NBC News Apparel web site. 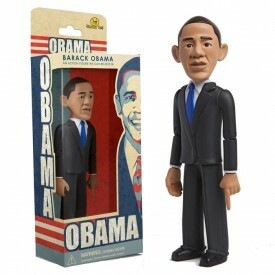 I could even purchase a bobblehead (there has to be a joke there), a collection of campaign photographs, and my favorite the Obama Action Figure. Unable to wait any longer, I dashed off my order.